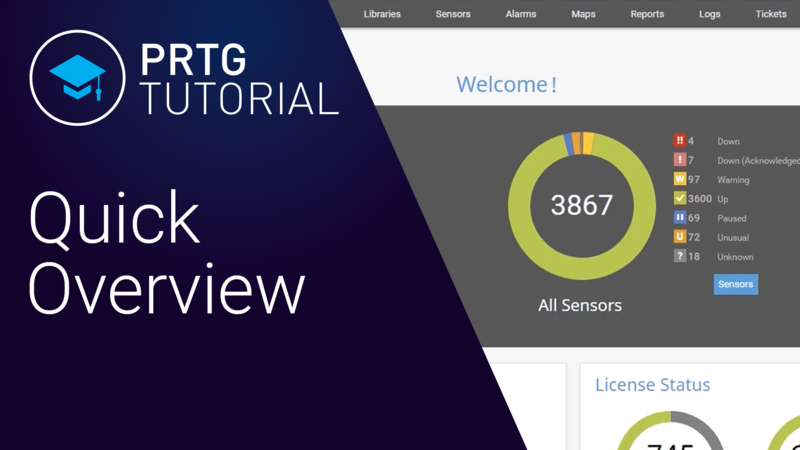 you start monitor your network with PRTG. information on using remote probes in distributed networks. 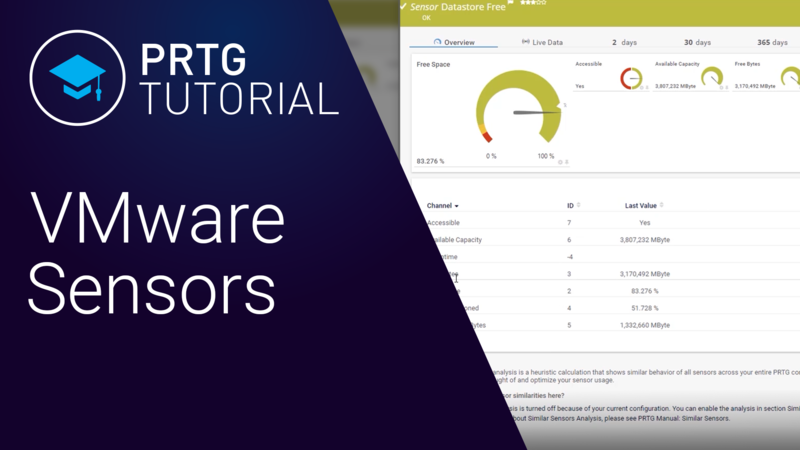 This video shows how to install PRTG Network Monitor and to configure the software to track bandwidth and network traffic and monitor network devices. 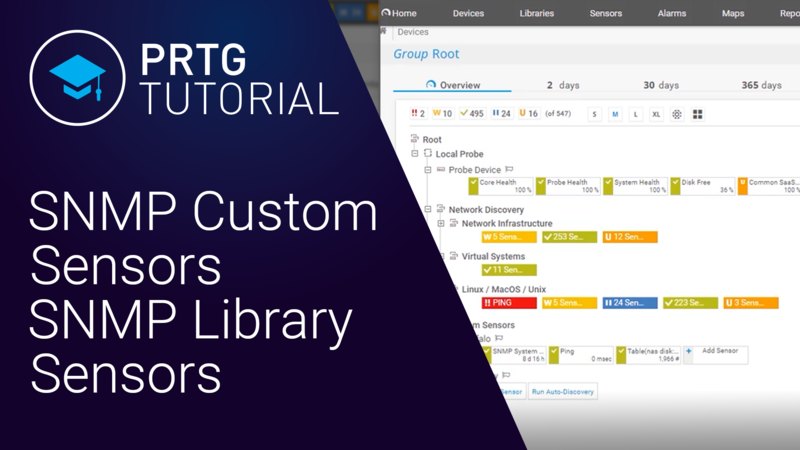 Learn how to set up your own libraries wihtin the network monitoring solution PRTG Network Monitor to get additional customized views of your devive tree. 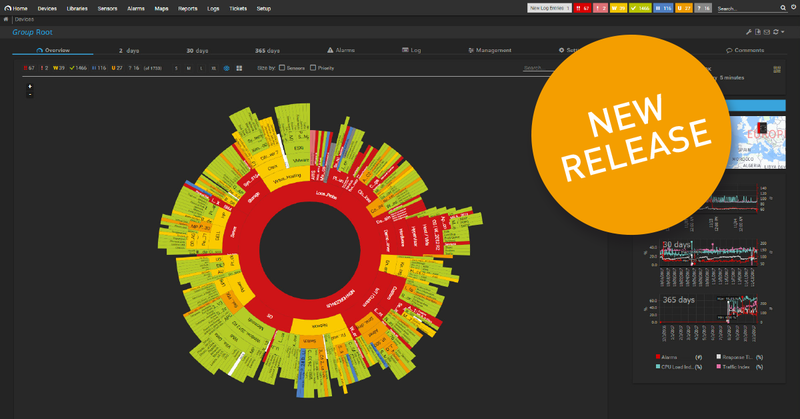 You can monitor not only uptime, but also entire workflows in your healthcare IT infrastructure using PRTG. 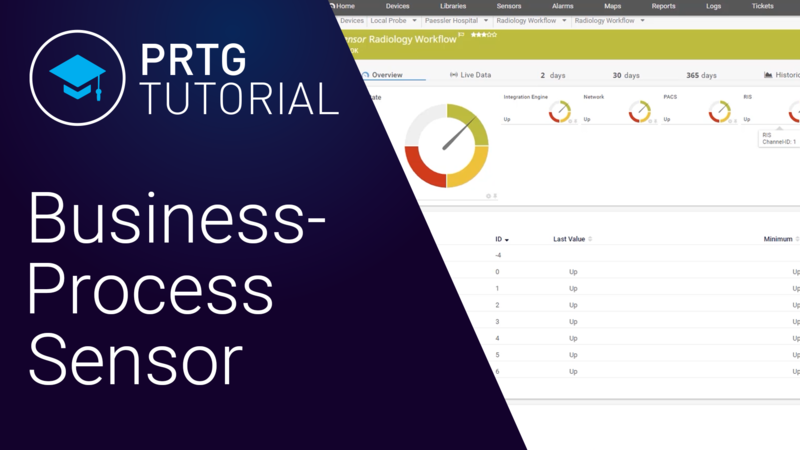 Shaun shows you how PRTG uses business process sensors to monitor all the aspects of a radiology workflow. 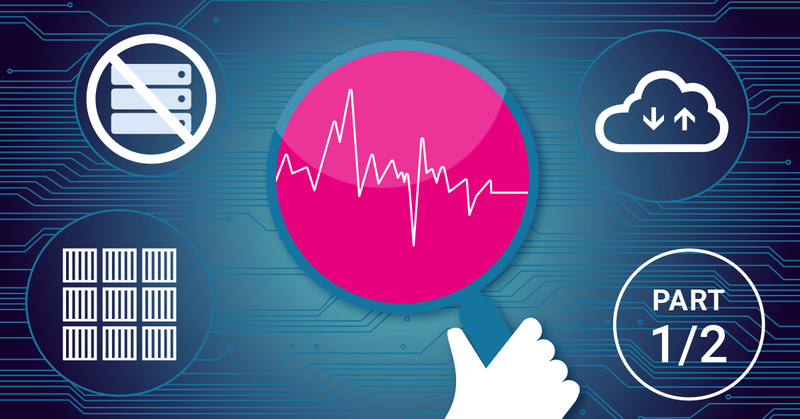 In healthcare IT, a lot of information is communicated using HL7. 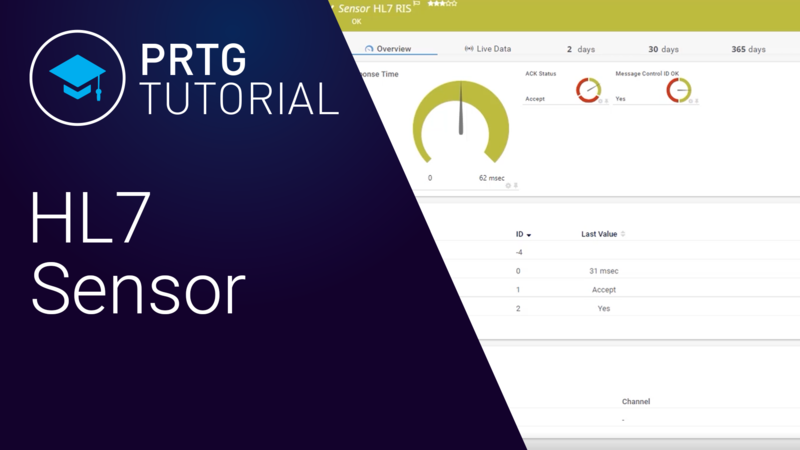 In this video, Shaun shows you how the HL7 Sensor in PRTG. 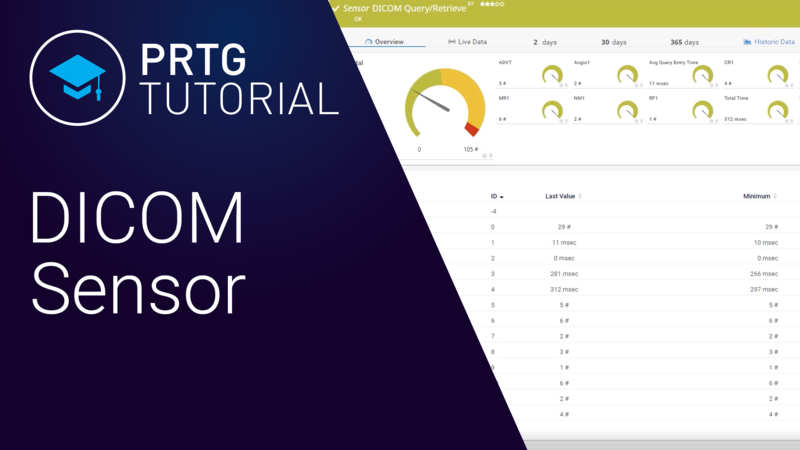 Shaun explains how you can use the DICOM Sensor in PRTG to monitor healthcare IT environments. 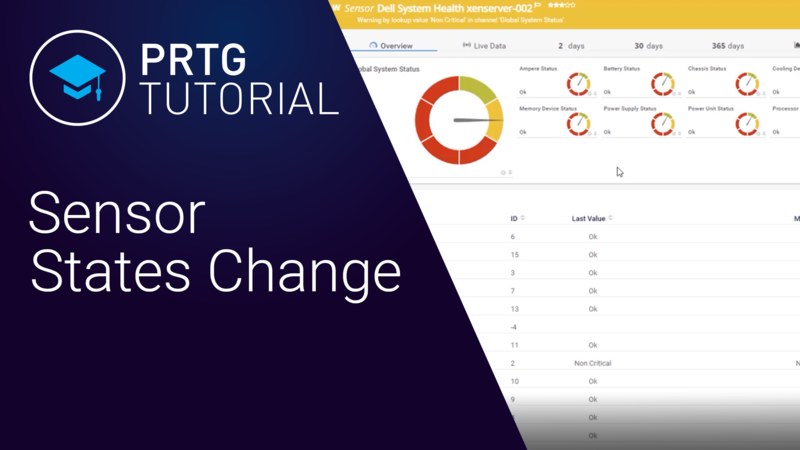 Heather takes you through the PRTG VMware Sensors, and shows you how to monitor the ESXi Host, the virtual guests, and the ESX datastores. 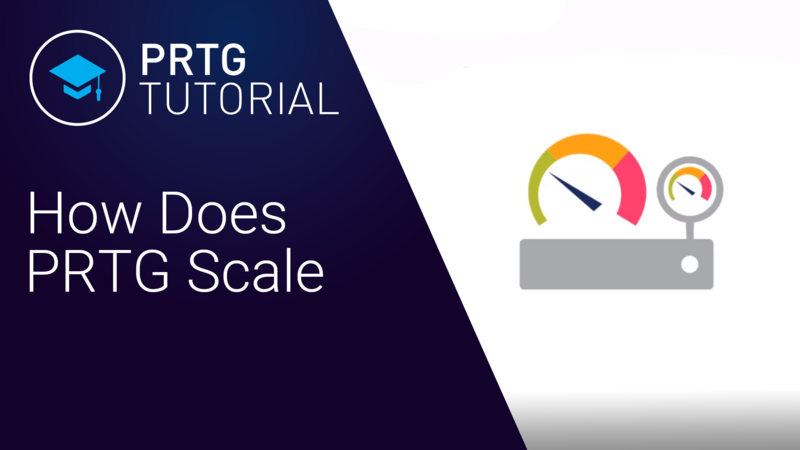 In this short video, I would like to talk about how PRTG scales. If you are planning a large installation, or want to scale and speed up your existing installation this is just the right video for you. 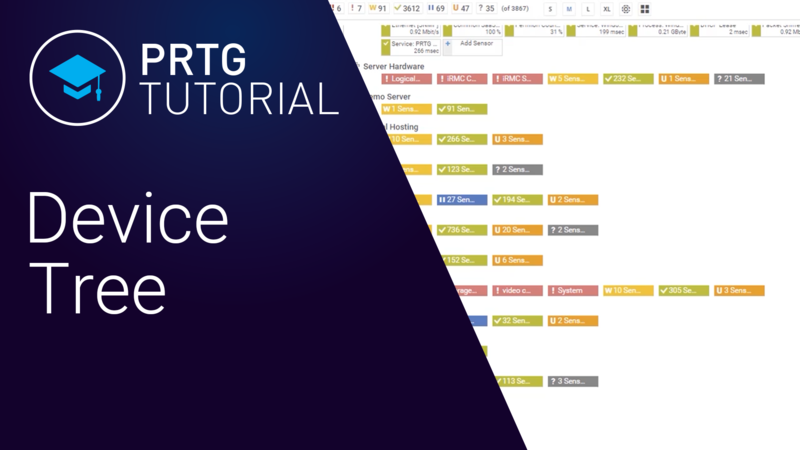 In this video, I'm going to give an overview of the different parts of the PRTG user interface. I won't go into each option in detail -- I'm just going to give you an idea of where to look for important functions, , so you'll be able to find things easier. We expand our map from the "Create Maps" Video. 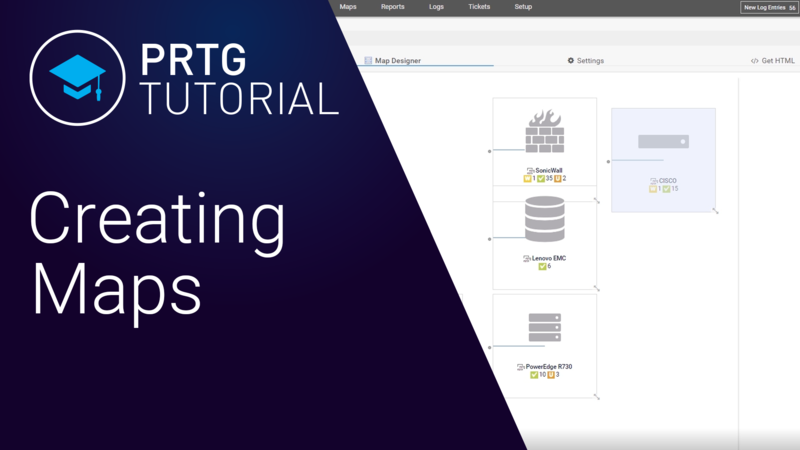 You'll learn how to visualize firewall traffic, expand the map, add weather data from an external source and how to devide the map visually into different areas. Learn all there is to know about maps and create a dynamic overview of your IT infrastructure. 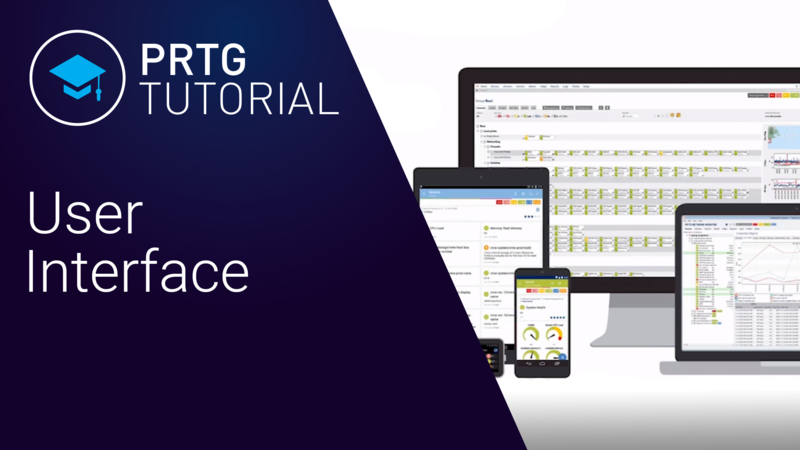 In this video we show you how to set-up monitoring of temparatures and PDUs with Gude appliance and PRTG. PDUs enable you to ensure the distribution of electric power to your data center. 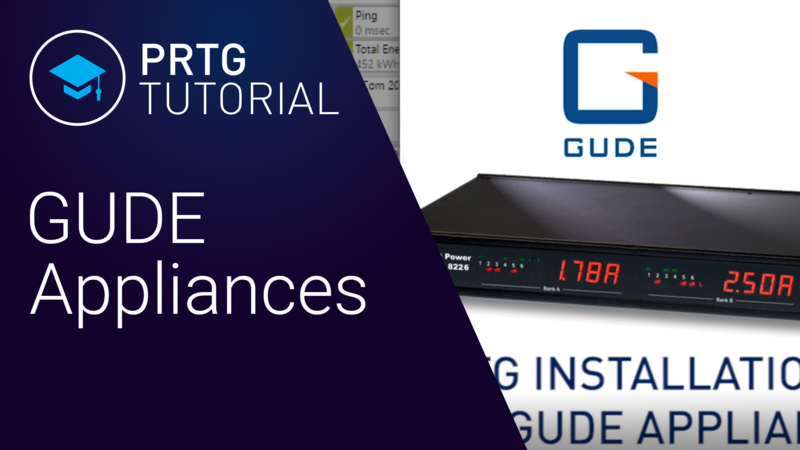 Gude offer appliances to measure environmental values like the temperature of your server room. 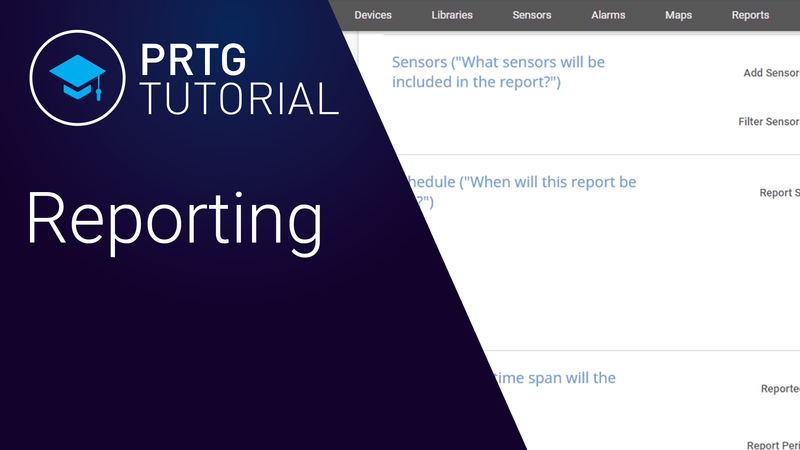 Wondering how you can add a sensor in your PRTG installation? Learn all about the three methods in this video. When does a sensor change state in PRTG? PRTG sensors can have multiple states, including up, down, warning and several others. In this video, we explain the different states that are possible, what situations lead to those states, and how to view a list of sensors in each state. 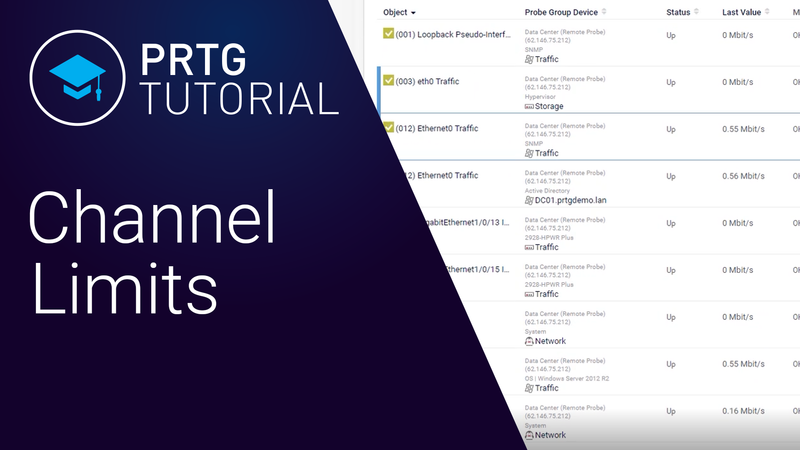 In this video, you’re going to learn how to configure channel limits in PRTG. 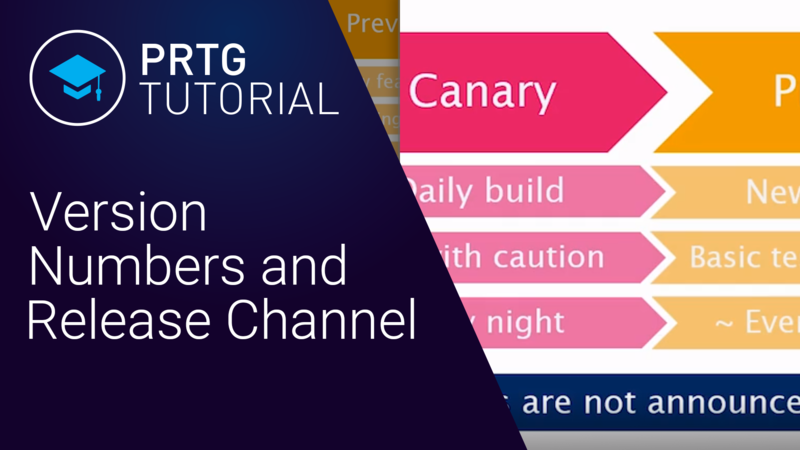 The channel limits are the upper and lower threshold limits, where you would like your sensors to go into warning or error state, so you can get a notification when something goes wrong. PRTG Network Monitor has a hierarchical structure of probes, groups, devices and sensors, called the device tree. 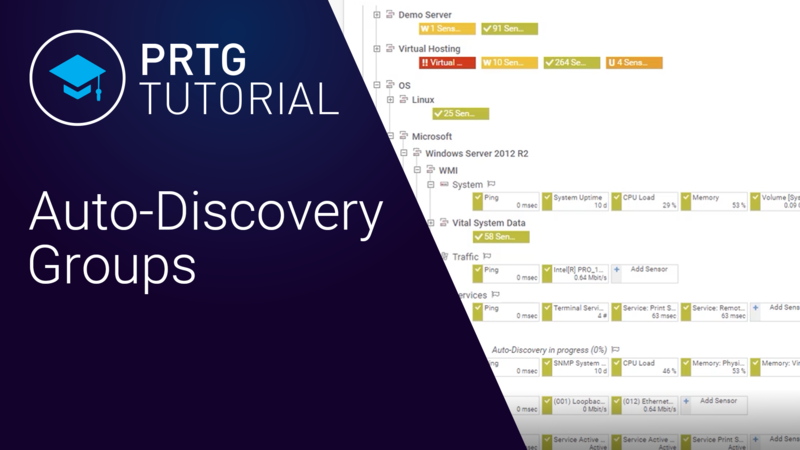 PRTG’s auto-discovery process will create a tree and group devices according to device type, such as network devices, servers, storage, etc. What do the parts of a PRTG version number mean? And what’s a canary release? 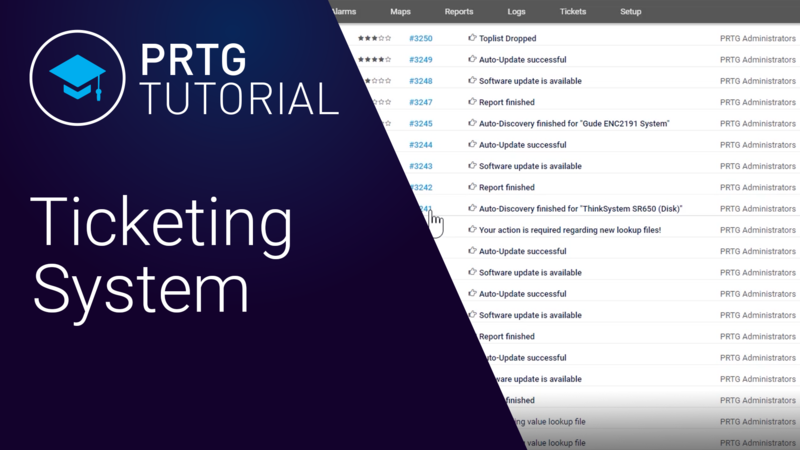 This video explains how PRTG version numbers work, and describes the three software release channels Paessler offers. 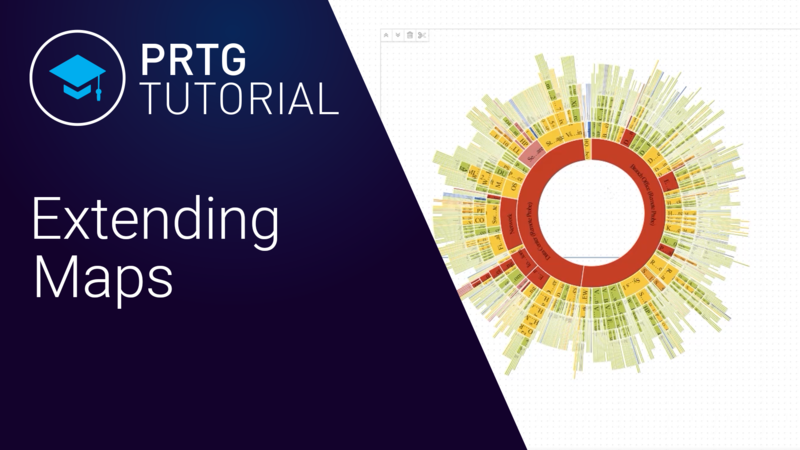 This video provides a brief introduction to the PRTG web GUI, for new users, to give you an overview of the different sections in the user interface, so you know where to look when you’re working with the software. Do you have a question about PRTG or need help with an issue? This video shows the different ways you can contact our support team to get the answers for which you are looking. Not sure which PRTG license you have? Or how much maintenance you still have remaining? 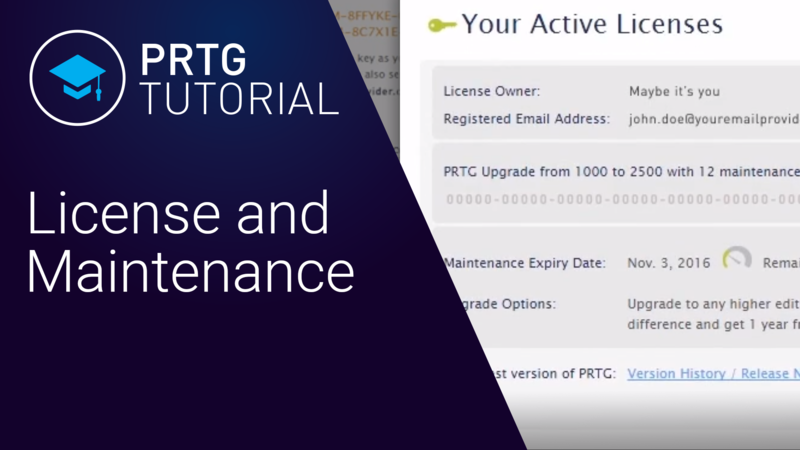 This video demonstrates how to look up your license and maintenance status, both inside PRTG and inside Paessler´s customer service center. 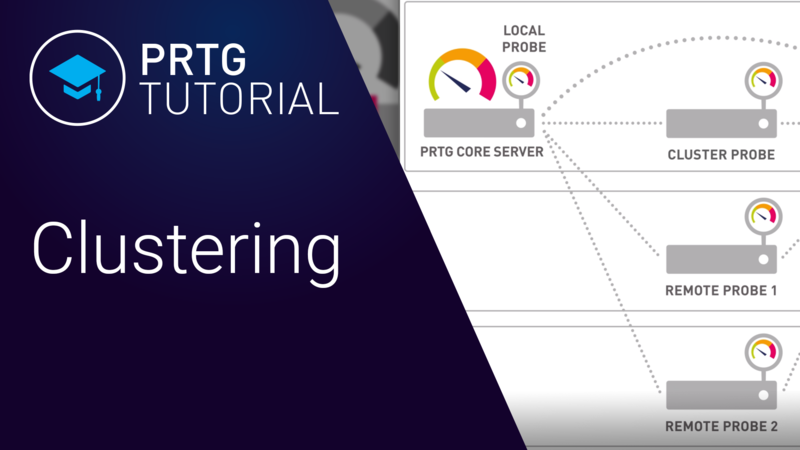 Here´s a very brief overview of the methods PRTG offers for monitoring bandwidth, to help you decide which methods you´d like to investigate in more detail. 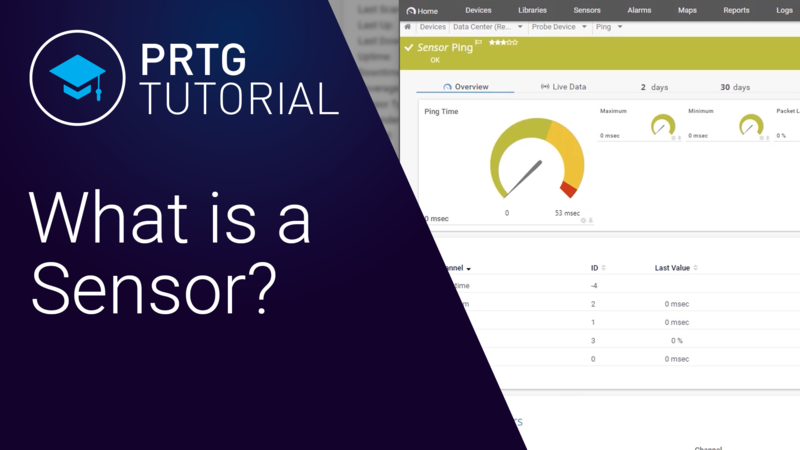 PRTG - What is a sensor? What, exactly, is a "sensor" within PRTG? What is a "channel"? This video discusses PRTG sensors and channels, including a few concrete examples of both, to illustrate this fundamental PRTG concept. 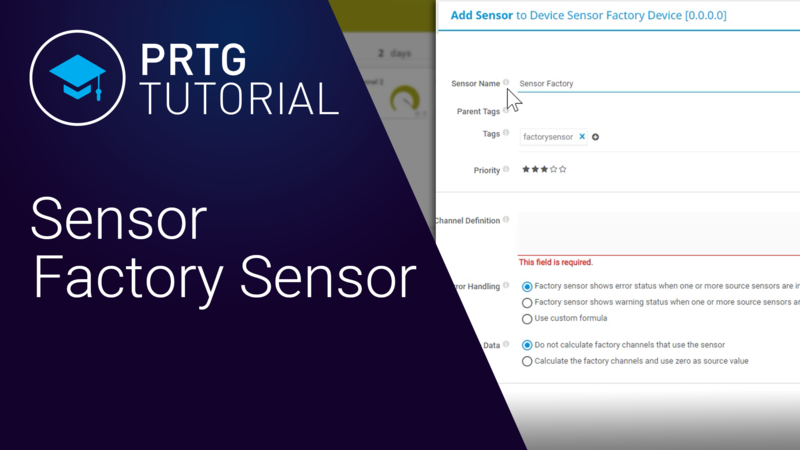 In this video, you'll learn about situations where a Factory Sensor is useful, and how to create one, step-by-step. 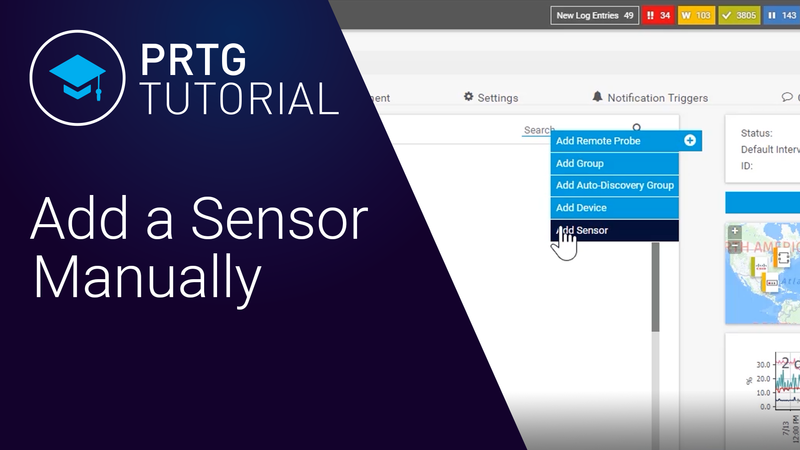 This sensor can help you monitor complex processes by combining the results from several sensors into a single, composite sensor. 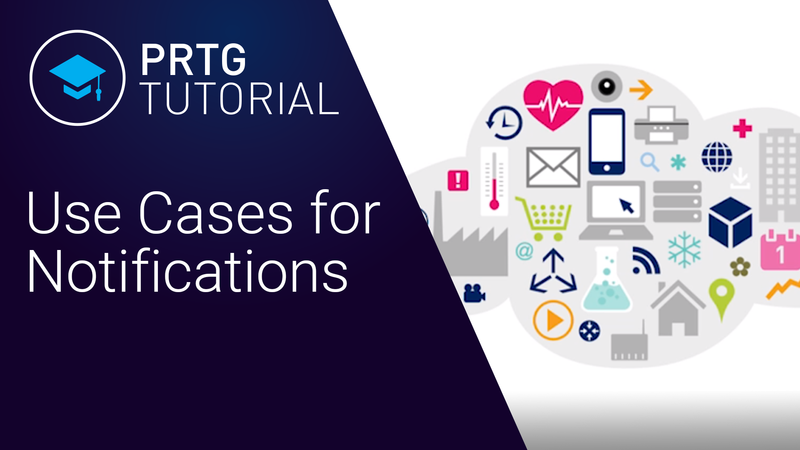 This video answers your questions about notifications in PRTG Network Monitor: why you need them, what types exist, to whom you can send them and much more. 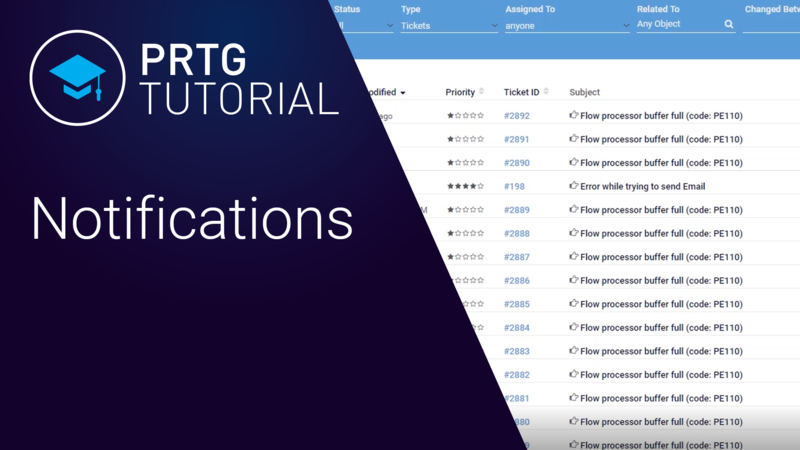 This video shows you some practical examples of how to use notifications in PRTG Network Monitor. We prepared a few use cases for you so you can see it in use. 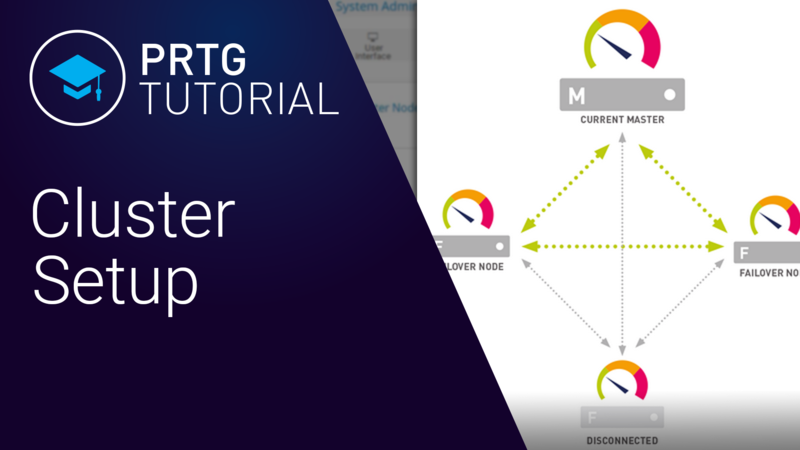 Watch this video to learn how a cluster in PRTG Network Monitor works, and how the components interact with each other, especially during a failover scenario. 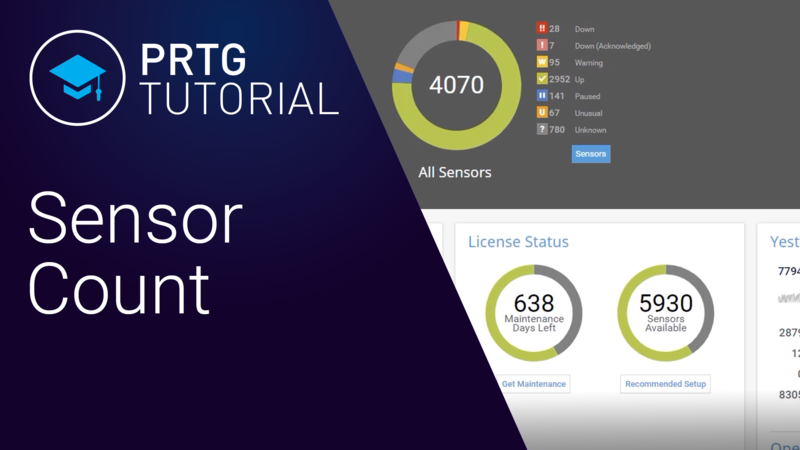 Watch our video and lern more about your sensors, how many you have configured in your PRTG and learn how easy it is to upgrade your license. 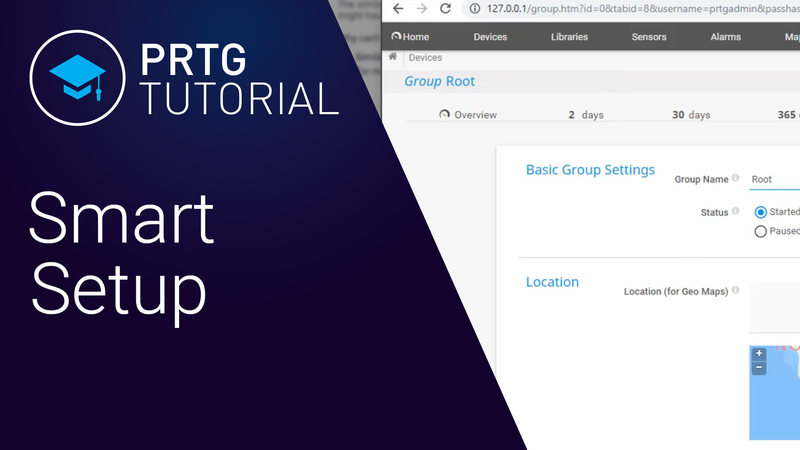 We will explain in this Video what you need to consider up front and how to set up a PRTG cluster with two servers: one master and one failover server. 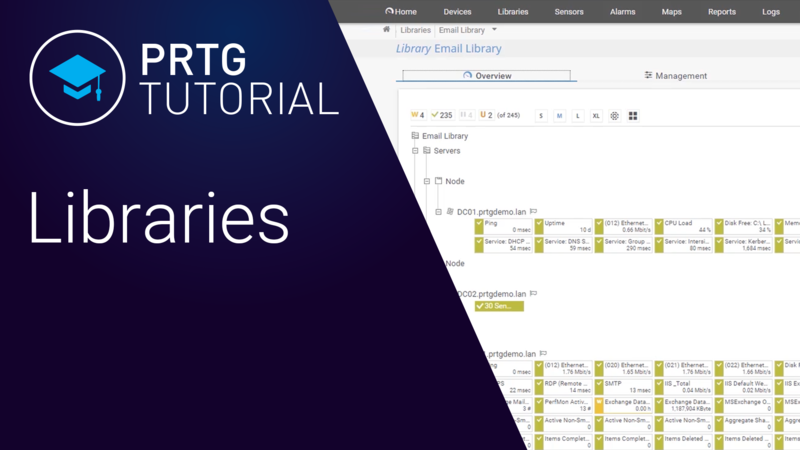 Here you will learn how to import MIB files into PRTG and how to use the OIDs in those MIB files to create SNMP custom and library sensors. 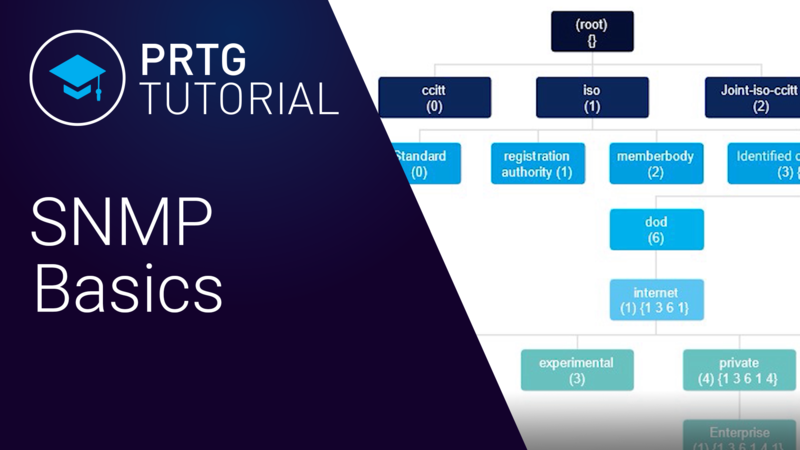 Watch our tutorial and you will get a short introduction to SNMP and all SNMP based sensors in PRTG. At the end you will be able to set up a SNMP sensor. 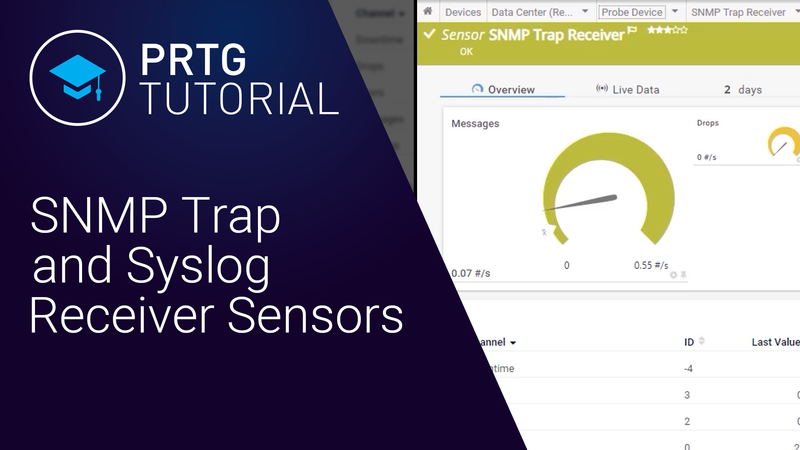 You want to learn what to do when you have problems with SNMP sensors? 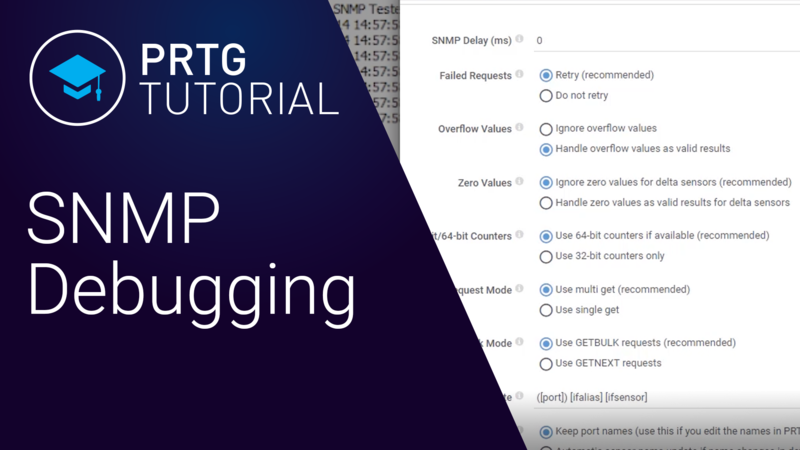 See what settings to consider and how to use the SNMP Test Tool for debugging. 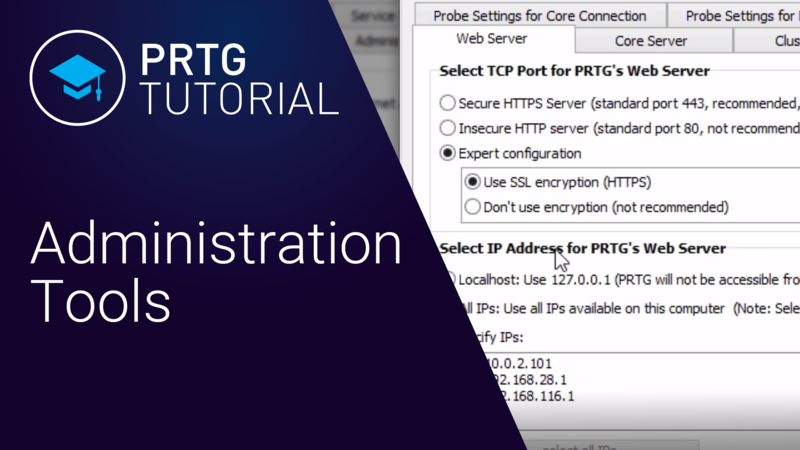 This video explains the PRTG Administration Tool, and its configuration possibilities during the installation like for web servers, clusters etc. 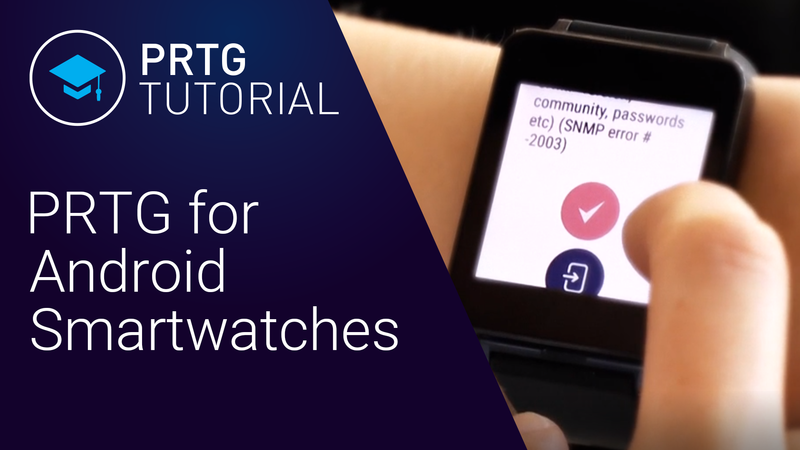 This Video shows you now a new feature for its Android app: PRTG for Android Wear allows you to respond to down sensors directly from your smartwatch. 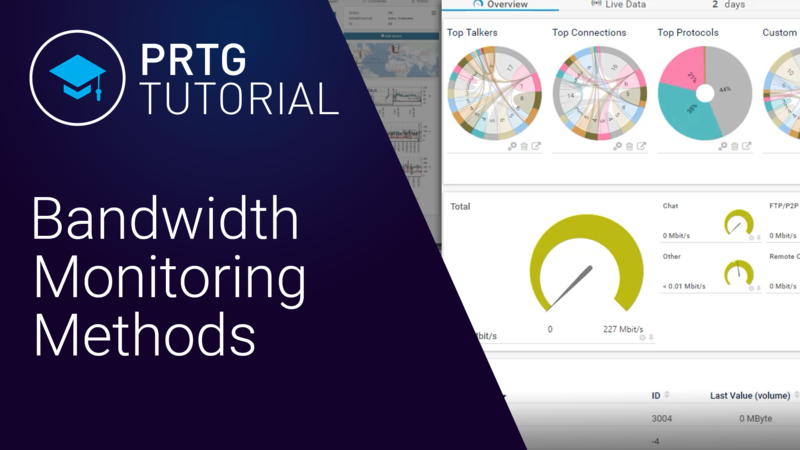 In this tutorial you get to know everything about bandwidth monitoring with flows and paket sniffing with PRTG Network Monitor. 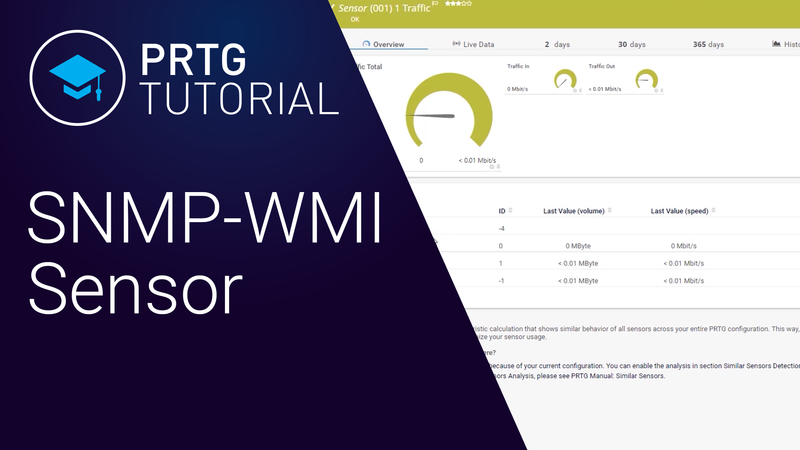 This video gives you a great overview about bandwidth monitoring with SNMP and WMI with Paesslers network monitoring solution PRTG Network Monitor. 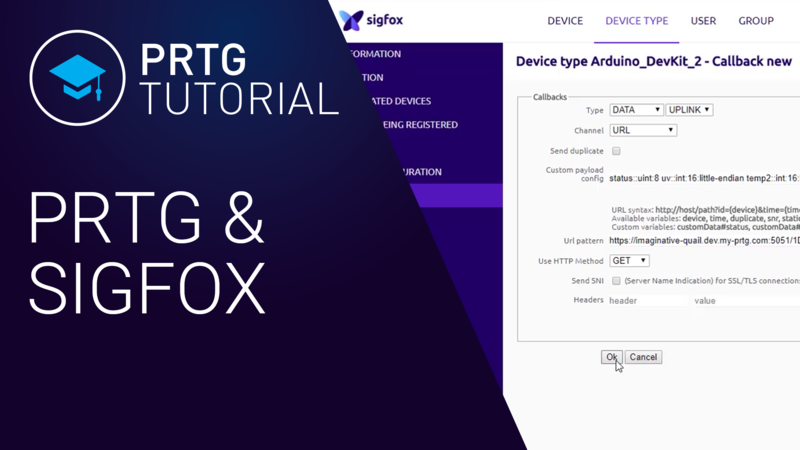 by Shaun, Content Factory In our new video we demonstrate how to set up a map within PRTG by using icons that represent the different devices, groups and sensors in your network and its connections. In the end you'll have a great overview about the components' status in your network on one slide! 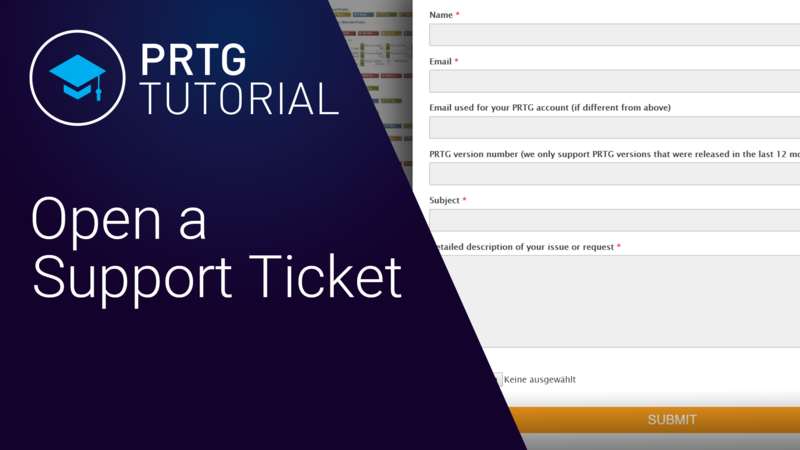 Have a look at our ticketing system inside PRTG Network Monitor and learn how to manage information about issues and tasks while monitoring your network. 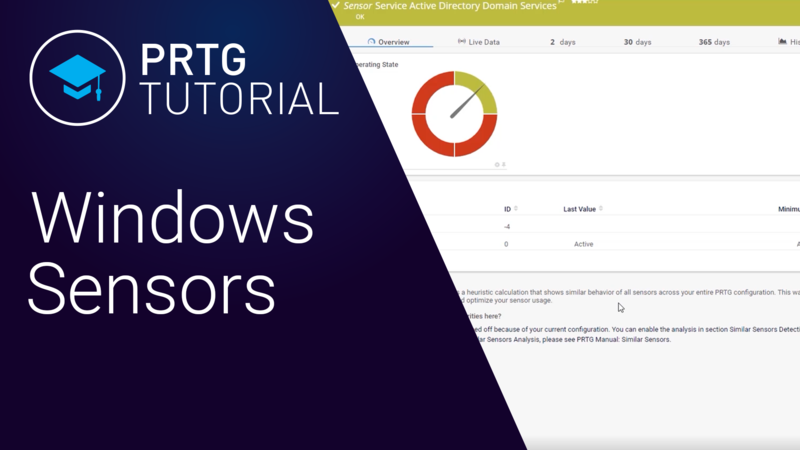 Learn in our video how to create and configure a Syslog Receiver sensor in PRTG Network Monitor and see how easily you can manage and filter these messages. 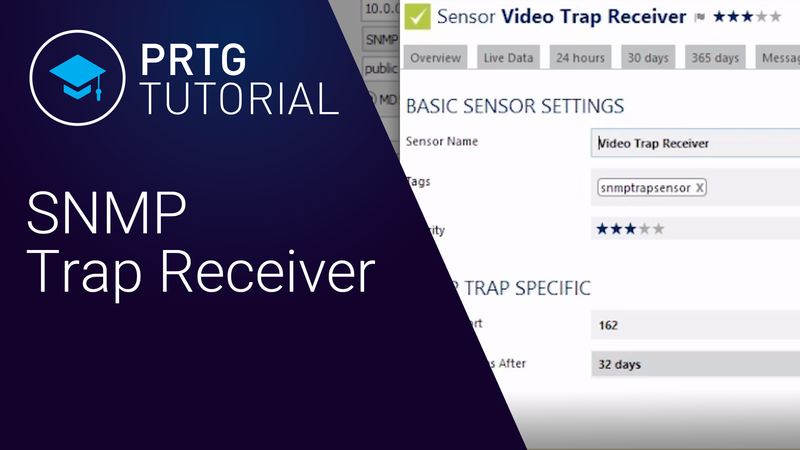 Watch our short video of how to set up a SNMP Trap Receiver sensor in PRTG Network Monitor and learn how easy it is to keep an eye on network via SNMP. 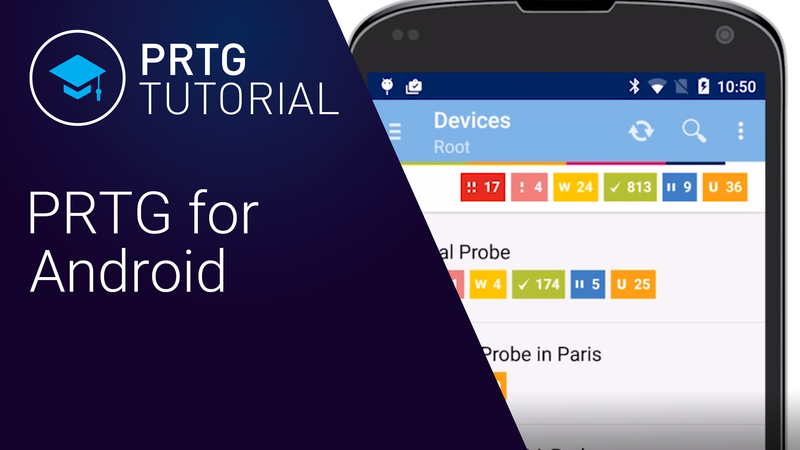 This tutorial shows you how easily you can manage your PRTG installation with PRTG for Android app. You can even monitor your network when you are on the go! 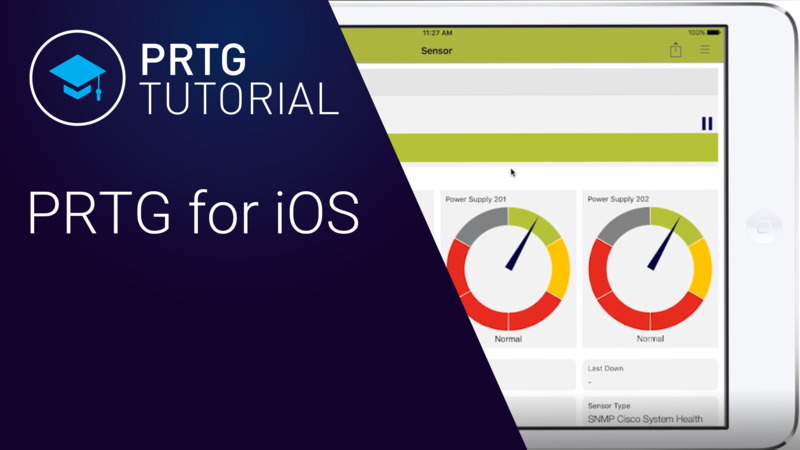 This tutorial shows you how easily you can manage your PRTG installation with our PRTG for iOS app. 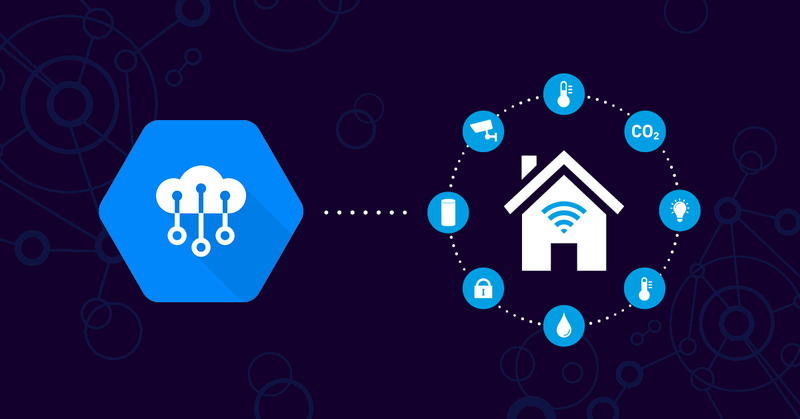 You can even monitor your network when you are on the go! 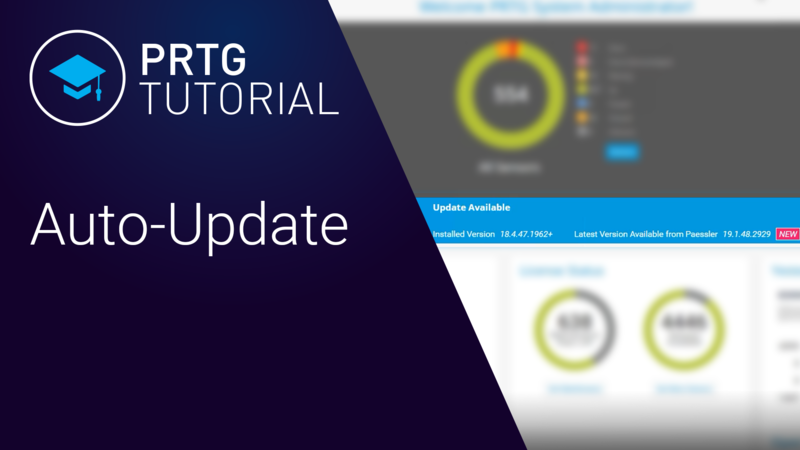 Auto-update for PRTG Network Monitor: As soon as a new version of PRTG is available, the admin user gets an email and can update his version. 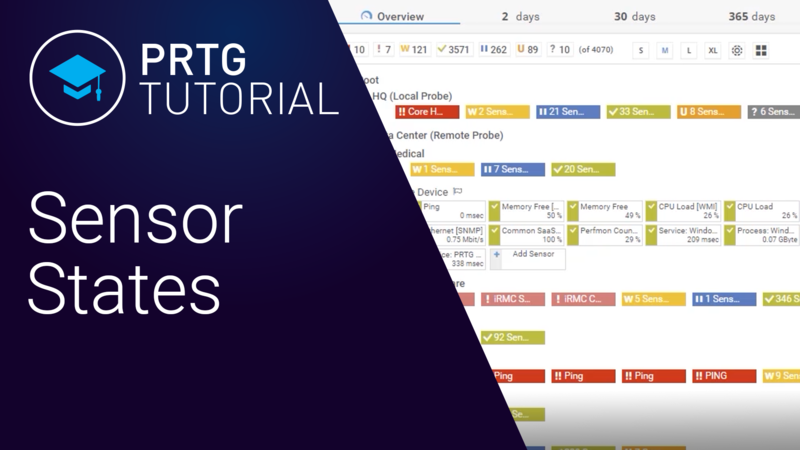 This animation video describes how PRTG Network Monitor monitors your local network as well as remote networks using different types of probes.